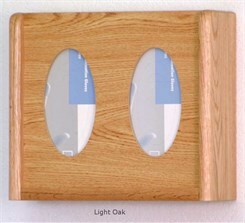 Oak glove box holders are an attractive way to hold your boxes of medical gloves. They will accommodate almost all brands and sizes of gloves. 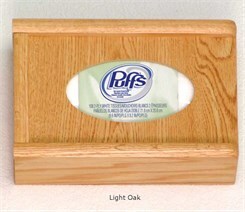 They also work well for standard size facial tissue boxes. 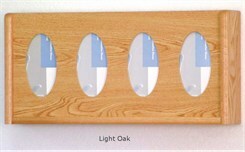 All glove box racks are constructed of 3/4" solid oak sides and bottoms with 1/4" laminate front panels. 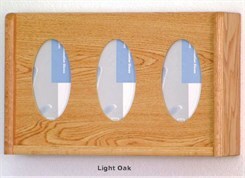 Racks come with small, medium, large, and x-large stick-on labels that can be attached by the customer if they choose. All racks are pre-drilled and include wall mounting hardware for easy wall mounting. Measures 7"W x 4-1/2"D x 11"H overall. Shpg. wt. 3 lbs. PRICE INCLUDES FREIGHT! Please allow 1-2 weeks for delivery. 1 - 2 $54.00 ea. Measures 12-3/8"W x 4-1/2"D x 11"H overall. Shpg. wt. 4 lbs. PRICE INCLUDES FREIGHT! 1 - 2 $59.00 ea. Measures 17-3/4"W x 4-1/2"D x 11"H overall. Shpg. wt. 6 lbs. PRICE INCLUDES FREIGHT! 1 - 2 $69.00 ea. Measures 23"W x 4-1/2"D x 11"H overall. Shpg. wt. 7 lbs. PRICE INCLUDES FREIGHT!